They say that everything happens for a reason and now when I look back to Mr. Boo being made redundant I can see this as a blessing. At the time, I couldn’t see passed our next mortgage payment and be worrying whether we’d be able to pay the one after that. His redundancy opened our eyes to what we were spending our earnings on and just how much we never looked at our finances. Since then we know just how much our bills are each month, what date they come out and how much we have left for the rest of the month to pay our bills. A couple of the biggest changes we made was to plan ahead for birthdays, Christmas etc. Using discount promo codes alongside putting a small amount of money away each week has allowed us to buy the items we want/need without the worry. 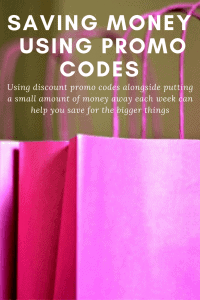 Whether you are looking for something in particular or just browsing the web it is always worth looking to see whether you can find a promo code for the retailer you are looking at. In the past, we have been lucky enough to save money on electrical items (even persuaded hubby that I did need a new Dyson in my life), clothing and even restaurants/takeaways. Savings are something that we all think that we can start another day. But what is stopping you? Can’t afford it? Can you really not afford it or is the thought of say £50 each month going out of your account putting you off? Well, we have a standing order set up that goes out each Monday for £10 which we save throughout the year just for the children’s birthdays and Christmas presents. Originally we had a standing order for £50 to go out at the beginning of the month but like you, it was a shock to see it go all at once. Although we are still saving the same amount, breaking it down across the month seems easier. I survive on wishlists and have a couple on the go at any one time. From children’s birthday ideas to things we need around the house, to listening to friends and family say ‘oh have you see the new XYZ, I like the look of that’ list ready for Christmas. Having these lists available means that whilst I’m searching for promo codes if I suddenly spot one for Debenhams I can buy Magic Nanny the top she wanted or Argos for toys for the children etc. How do you save money for Christmas? Previous Post: « Transformers Rescue Bots joins Tiny Pop! I so need to learn to save but it seems we just burn through money and we aren’t exactly on mega bucks either. promo codes can make such a diference cant they I need to find a brilliant one so i can upgrade my iphone ! !